Future Generation Kiosk Products.i-Touch V46 Slim-Line Glass Floor standing kiosk with Low-level 17'' screen - Future Generation Kiosk Products. 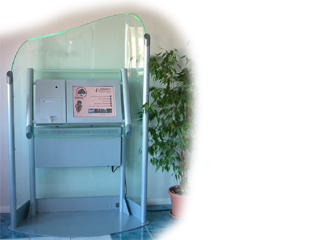 The v46 kiosk unit is designed to comfortably accommodate wheelchair users, whilst maintaining a stylish design. The large area behind the screen is ideal for advertising or identification.